As you all know, a well thought out supplement plan is an essential element in anyone’s health/antiaging program. I am no exception. 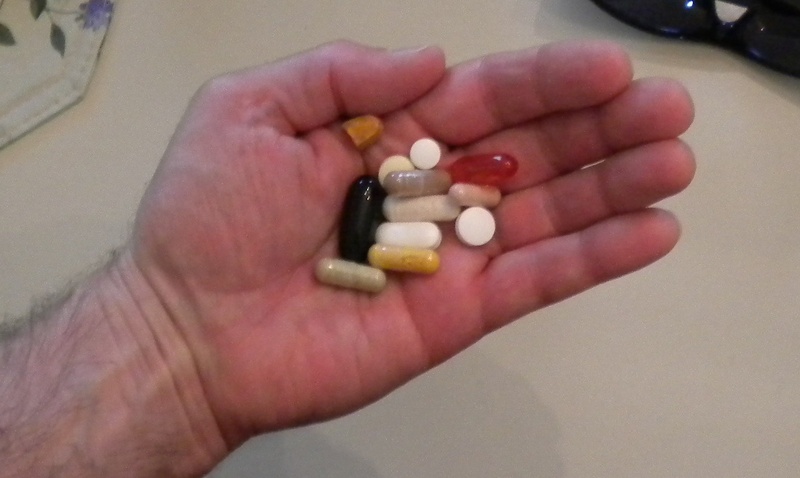 Here is my own pill-poppin’personal power protocol. I’ve designed it after very extensive research and also some serious budgetary considerations. If you would like to slow or even reverse the aging process, get a shot of extra energy, think clearer, live longer and feel better, maybe you ought to check it out. I have listed links and supporting evidence for each one. You probably are even using some yourself right now! “A” is for Alpha lipoic acid. This is probably the most powerful anti-oxidant you can find. It is both water and fat soluble, it recharges other antioxidants after they have done their job, and it is an essential part of the energy generation process. (citrus acid cycle) Alpha lipoic acid works synergistically with CoQ10 to improve energy (mitochondrial function) and it even chelates (clears) heavy metals. A top choice and reasonably inexpensive. “B” is for B Vitamin complex. A good one contains all the B vitamins, which are essential for carbohydrate metabolism and energy generation. B3 (niacin) can control cholesterol, B12 (cobalamins) protect the brain, most of them are essential for hormone production. Quite a package and very cheap to boot. “C” is for CoQ10. CoQ is essential for the energy process as I noted in a post recently. It is an antioxidant that works right where most free radicals are produced – the mitochondria – so it is invaluable, and essential to health. CoQ production diminishes with age, but is is easily absorbable and not too costly. If taking statins you really must supplement it. “D” is for – that’s right Vitamin D. This vitamin actually works more like a hormone, it influences so many biological functions. Most people are not getting enough vitamin D. It’s required for much more than calcium absorption; insufficient vitamin D can lead to cardiovascular problems, weakened immunity and system-wide inflammation. Vitamin D is deficient in most diets, if you are not getting a lot of sunshine you should supplement with 1000-2000 iu of it daily, particularly in the winter months. “E” is for my “two-per-day” multivitamin shown which contains vit E along with C and a spectrum of other important ones. Everyone’s supplement plan should begin with a multi, they ensure against the inevitable dietary shortages we all experience. “F” is for Fish oil. The Super Omega-3 shown above provides ample EPA and DHA, essential polyunsaturated fats for good health. Their vast benefits are touched on right here. Omega 3’s are probably your most important supplement, their broad function is very well documented. Here is one nutrient that is actually better taken supplementally than dietary because of possible contamination issues from pollution. It is a very inexpensive and safe one to use too. “K” is for the fat soluble vitamin K. This one is often overlooked by most multi manufacturers, and though it is available in many foods such as leafy green vegetables, the dietary portion is not very well absorbed. Vitamin K is important for cardiovascular health as is well known, but bone integrity also relies upon it. More on Vit K (and D) here. “M” is for Magnesium. This mineral is involved in over 300 metabolic functions, and despite many dietary sources there is still rampant deficiency. I have discussed magnesium here, it’s role is as broad reaching as calcium, a mineral it often works hand in hand with. I would also recommend supplementary calcium, but it’s not part of my own protocol because I get a lot in my dairy and other foods consumption. Magnesium is very cheap, be sure to include it. “P” is for PQQ – Pyrroloquinoline quinone. I started taking this substance about a year ago when I found that it can actually stimulate the growth of new mitochondria in the cells. As mitochondrial dysfunction is one of the hallmarks of aging it fit in well with my agenda of “age reduction”. PQQ is the most powerful antioxidant for preserving the health of your little dynamos. According to a study by the Univ of California “Pqq is 30 – 5000 times more efficient in sustaining redox recycling (in energy production) than other common antioxidant compounds” (like vitamin C). (See “Studies” page) Pqq is a bit costly however, but you can use it for certain terms, as I do. “R” is for Resveratrol. This is a polyphenol present in red wine (grape skins), peanuts and chocolate that has gotten great publicity as an “lifespan prolonger” due to it’s effect on genetic expression related to aging. It’s benefits are very similar and also synergistic to the “calorie restriction” plans advocated by life extension experts. More on this nutrient here. That’s my own personal list. As you’ll note it is not only geared toward general well being, but it also follows developments in longevity and antiaging. As stated above I have scrutinized each one individually as to veracity of its benefits and also it’s wallet friendly nature. Hope you can integrate a few of these into your own plans. This entry was posted in Energy, supplements and tagged antiaging, diet, health, minerals, omega 3, supplements, vitamins. Bookmark the permalink. Thanks for the reply, I hope you like my stuff! Theres quite a lot of bottles there, do you take them all at once or do you spread them out throughout the day? All at once, and then a couple of them a second time in the evening! It’s easy to swallow PJ, once you get used to it. I know guys who do hundreds per day; I prefer to limit it to the tried and true. Thanks for the comment! And yes, I would love to do a guest post on your blog, just name the topic. Making connections is what growth is all about. I am currently writing a book on enhancing immunity, and I expect to publish in a few months. Great web site. Plenty of useful information here. I am sending it to a few friends ans additionally sharing in delicious.